UCOG Today [Paul Kieffer] » Blog Archive » What’s your excuse? Having a little trouble getting motivated to change your life? Maybe this little fellow’s example will help get you going. Is there something you want to do in your life but keep putting off? For me it has been getting back into regular running. he won two gold medals. Cody’s succession of prosthetic legs over 5 years. I ran a marathon for the first time nearly 5 years ago. Afterwards I kept up with running, finishing two half marathons in the next couple of years. In the last year or so I had slacked off and was wondering if I would be able to get back to regular workouts. Then I heard about Cody McCasland, who is 7 years old. He was born with a rare birth defect called Sacral Agenesis, arriving without any tibia or knee bones. At the age of 15 months, he had to have his legs amputated below the knee. Two months later he was fitted with his first pair of prosthetic legs, and hasn’t stopped moving since. His mother Tina said: "Hardly anyone takes to prosthetics so well. It was amazing – it was as if Cody had just been waiting for the chance to have new legs so he could walk. We’ve always said whatever Cody wants to do, we will do our best to let him have that opportunity. He won’t let his disability hold him back." And hold him back it doesn’t! Cody now manages to run, swim, play soccer, golf, karate and ice hockey as well as being a boy scout and going rock climbing in his home state of Texas. Over the past year Cody has continued to challenge himself physically. Cody competed at the University of Central Oklahoma Endeavor Games, again winning gold medals in running and swimming. He competes as a double amputee on an able-bodied competitive USA swim team, the Texas RiverSharks. Cody has run in multiple local one and two mile runs and kids races, including the kid’s run at the San Diego Triathlon Challenge. He also ran the last portion of the Team Cody Relay at the Dallas White Rock Marathon. Cody also helps others. Read about his fundraising efforts. 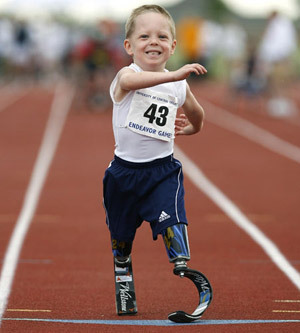 Now, after reading about this gutsy little guy, what’s your excuse for not doing what you need to do?